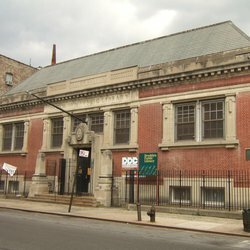 Two thousand people gathered to open the Macon Branch in 1907, the 11th Carnegie library in Brooklyn. The two-story Classical Revival red brick library retains its original fireplaces, oak paneling, alcoves, and wooden benches. To author John Steptoe (1950-1989), who wrote his first book, Stevie, at 16, said he wrote because of the “… great and disastrous need for books that black children could honestly relate to”– Macon was home. Macon also has a circulation collection of information about the neighborhood. “Preserving Footsteps,” has books concerning the history, famous locations and current situation of the neighborhood.